A huge pile of giant pumpkins is what comes to my mind when I think of Halloween. So how about some really cute mini-pumpkins made with homemade marshmallow fondant. Sounds yummy, yeah? Luckily I found a bag of white and pink marshmallows in Nilgiris in Mangalore. I used only the white ones and nibbled on the pink ones while I made these. Check my post on Homemade Marshamallow Fondant to get step by step pictures on how to make fondant. I used only 1 cup marshmallows with 1 cup sugar and 1 tsp water. You can easily increase or decrease the quantities depending on how many pumpkins you want to make. [You can, of course, use store-bought fondant]. 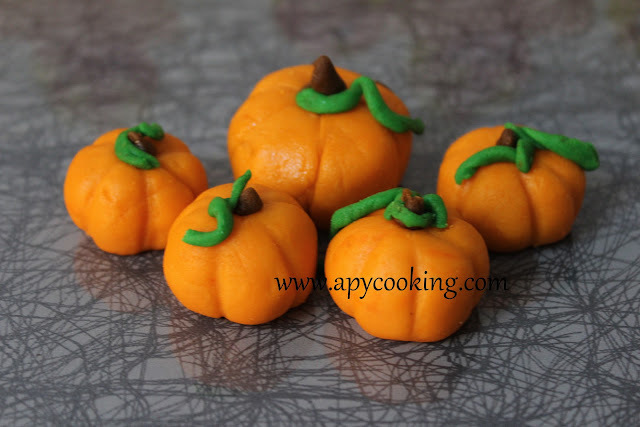 Once you make the fondant, just eyeball, or roughy divide it into the number of pumpkins and their size, setting aside a little bit of fondant for the stems and leaves. 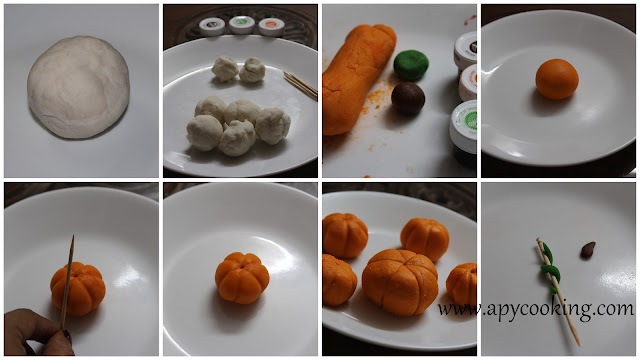 Colour the fondant orange, green and brown accordingly. [You can even use a piece of chocolate instead of brown fondant for the stem.] I used Wilton's Icing Colors (concentrated gel). To colour, just make streaks with the colouring with a toothpick and knead really well to spread the colour evenly (Check this post). Repeat till you get the shade you desire. Take a small portion of the orange fondant. Roll it into a ball. Using a toothpick poke a hole in the centre at the top, and make verticals markings on the side (you can even use a butter knife).There, you have a cute pumpkin. 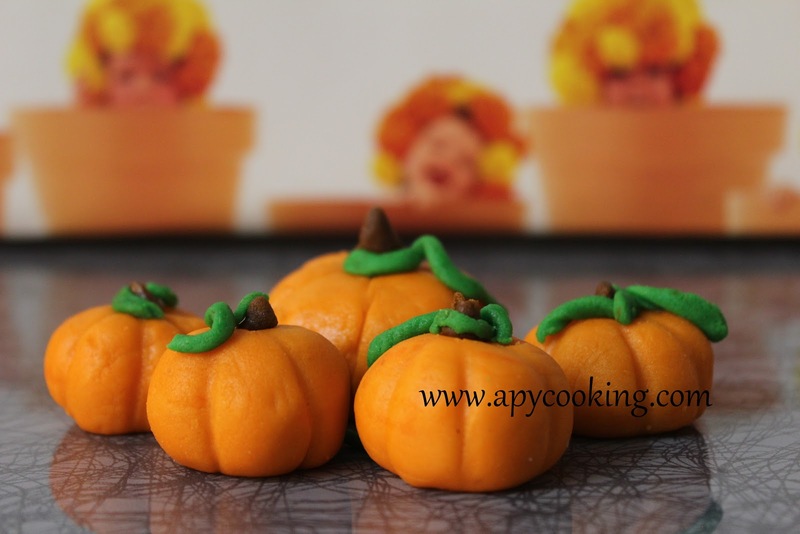 Make small stems with the brown fondant. For the green creeper, just curl green fondant around a toothpick like you see in the picture. Remember, fondant dries easily and won't be very malleable once it dries. You may have to knead it again to mould it into the desired shape. To fix the stem and leaves to the pumpkin, use a dab of water. 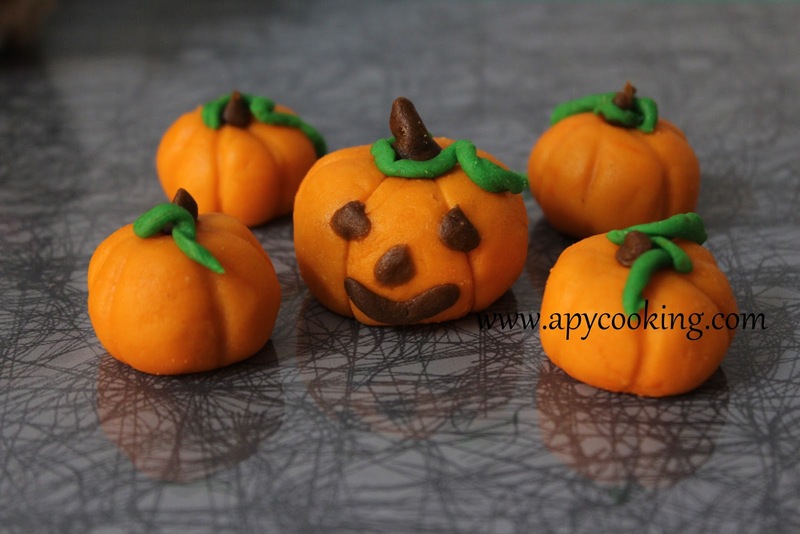 You can serve these pumpkins as is or station them on a yummy cupcake. Now how is that for a super-cute Halloween treat!! Here are a couple more. Go on, rock your halloween! It's raining here tonight (yes, in October) and what better companion than a bowl of hot soup to keep you warm! 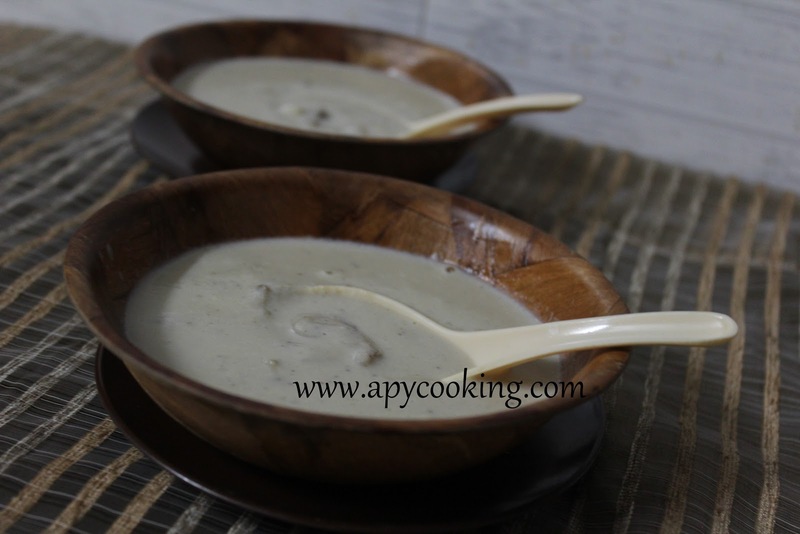 The only thing missing is my husband's company since he is miles away, but that's not going to stop me from relishing this creamy, steamy, earthy, delicious soup! In a pan, heat butter. Roast garlic for a couple of minutes. Add mushrooms and roast for a few minutes. Remove about 2 tbsp of this mixture and keep aside in a bowl (for garnishing). 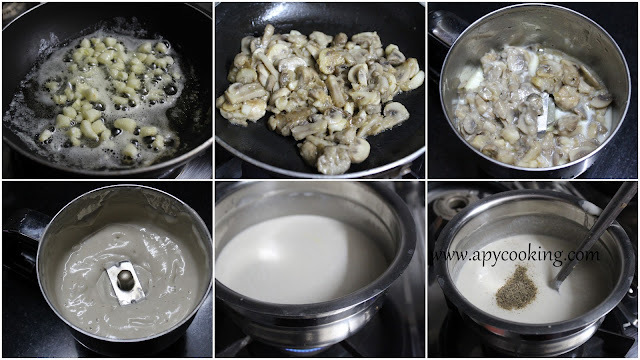 Add maida to the remaining roasted garlic and mushrooms and roast for a few minutes. Transfer to a blender and blend with 1/2 cup milk (add milk a little at a time). Add 1/2 cup water and blend again. Transfer to a vessel. Add another 1/2 cup milk and 1/2 cup water and bring to a boil. Sprinkle ground pepper. (If you are using fine pepper powder, mix with a little water before adding). Add salt to taste and add the roasted garlic-mushroom kept aside for garnishing. Cook for a couple of minutes. Watch the rain, sip the soup and stay warm! 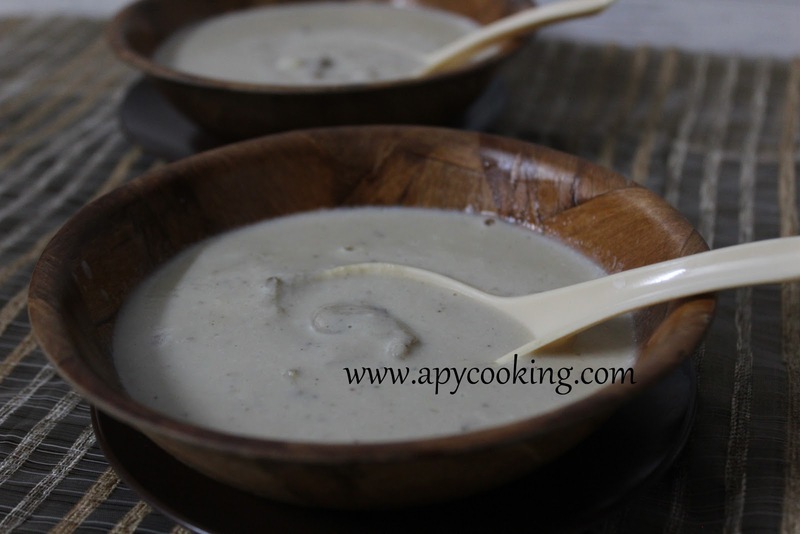 Note : You can adjust the quantity of milk and water depending on how thick or thin you want your soup. This recipe serves 2 and you can easily increase the measures. Also, I prefer to grind whole pepper and add the fine granules which give a better peppery flavour, as compared to store-bought pepper powder.